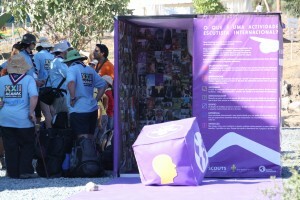 (Lisbon/CNE) – Last month, 17000 Scouts gathered for seven days at “ACANAC 2012” at CNE’s (Corpo Nacional de Escutas) National Activity Centre in Idanha-a-Nova, Castelo Branco. Among them were 110 Scouts from Spain, the United Kingdom, Luxembourg, France, Sweden and Guinea-Bissau, and a team of Portuguese volunteers ready to receive them and to bring the international experience to the thousands of Scouts from all over Portugal. ACANAC – CNE’s National Jamboree – usually takes place every four years. 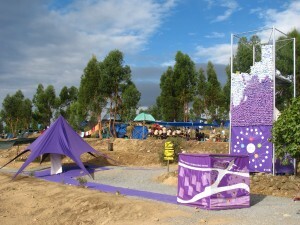 Reflecting the 2012 edition’s main theme “Scouting – Education for Life” and under the assumption that having international experience was essential in the education of young people sters who are growing up in increasingly global and multicultural communities, CNE’s International Team worked together to bring a strong international experience to the largest scout camp ever held in Portugal. 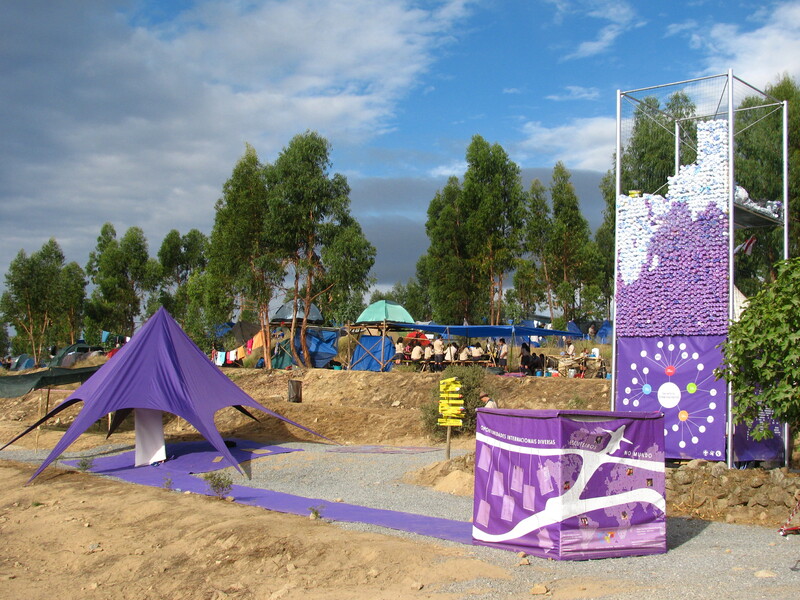 The International Team’s HQ was a tower projected to have 8000 recycled PET bottles make up a world map. This map, where Portugal was represented by two sole bottles, is the protagonist of the International Team’s campaign, which aims to make the scouts put their experience into perspective by scaling up the world they know to the world that is still left to discover. Even though the PET bottle project remains unfinished, it was under the shadow of the tower that the real international experience took place. 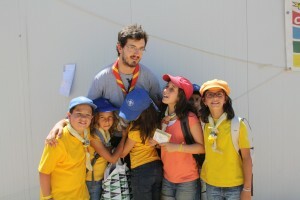 Here, the team provided a number of workshops aimed at developing hands-on multicultural and World Scouting experience. 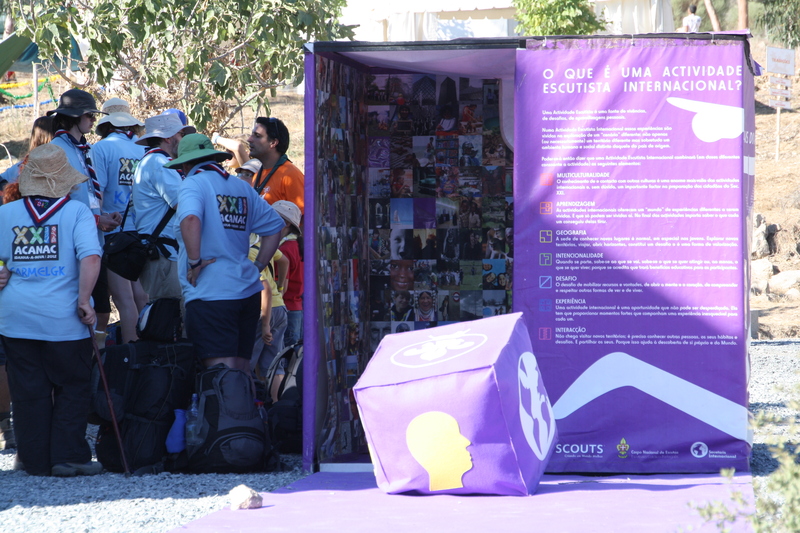 Throughout the week, around 4000 Scouts took part in different workshops such as Religions, World Scouting, Getting to know Lusophonia (the Portuguese Speaking Countries), Partnerships in Scouting, Messengers of Peace and World Dances. The rest of the action took place in the scorching terraces of the camp, where Scouts from abroad, from Cubs to Rovers, mingled with their new Portuguese friends and adjusted to the conditions which, for some, were very different from the ones at home. 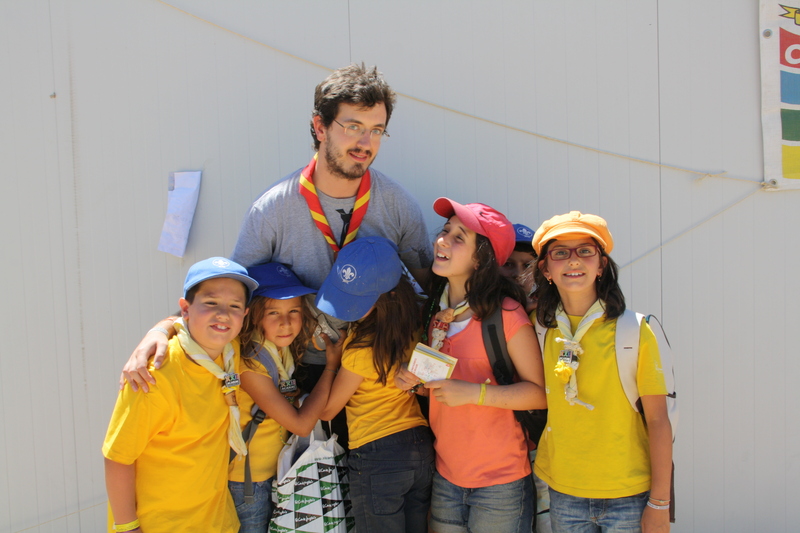 Scouts from Britain and Sweden for example, who are usually prepared for rainy camps, had to deal with temperatures around 40ºC, whilst the rare Spaniard was frequently chased down by eager Scouts chasing autographs to complete a set activity. 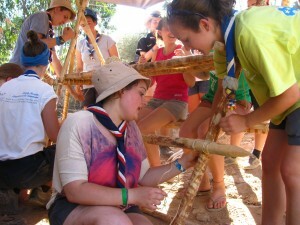 It is, in fact, in these exchanges, where Portuguese Scouts constructed a wooden table with the UK Scouts, a Scout from Guinea taught young Scouts a typical African dance, or Scouts from abroad traded scarves and badges, that we see our young members beginning to deal with the multicultural challenges that this world brings them. After craftily overcoming the language barriers, the Scouts came to face with the notion that there are more common interests between them than the differences that set them apart as cultures. The perception of these differences was then transformed into the curiosity of getting to know them better; and in this curiosity lies the openness with which our young and older Scouts will face future challenges in a world with barriers which are no longer so much defined by distances as by cultural differences. It is by experiencing that we get to know and respect, and this is how we aim to educate our Sscouts for a life in a global, multicultural world. PS: The International Team of CNE would like to thank all the ISTs who helped out with the activities, as well as Patrik Hedljung. WOSM’s outgoing Director of Global Projects, who kindly collaborated with the Messengers of Peace workshop.